YOU DESERVED SO MUCH MORE, LITTLE FLOWER. YOU DESERVED A WAKANDA THAT CHERISHED YOU. 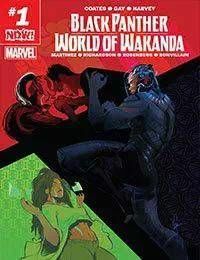 Writer ROXANE GAY (Bad Feminst, Hunger) spins a Wakandan love story — its tenderness matched only by its brutality. You know them now as The Midnight Angels, but in this story they are just Ayo and Aneka, young women recruited to become Dora Milaje, an elite task force trained to protect the crown at all costs. What happens when your nation needs your hearts and minds, but you already gave them to each other? Illustrated by industry veteran ALITHA E. MARTINEZ (Iron Man, Black Panther). And in a special backup story, acclaimed poet YONA HARVEY (Hemming the Water) explores the true origins of The Peoples mysterious leader Zenzi. Black Panther thinks he knows who Zenzi is and how she got her powers, but he only knows part of the story… Illustrated by rising star AFUA RICHARDSON (Genius).